It all began with a black and white photograph of a soldier reading a Greek newspaper, “somewhere in the Pacific” during WW2. 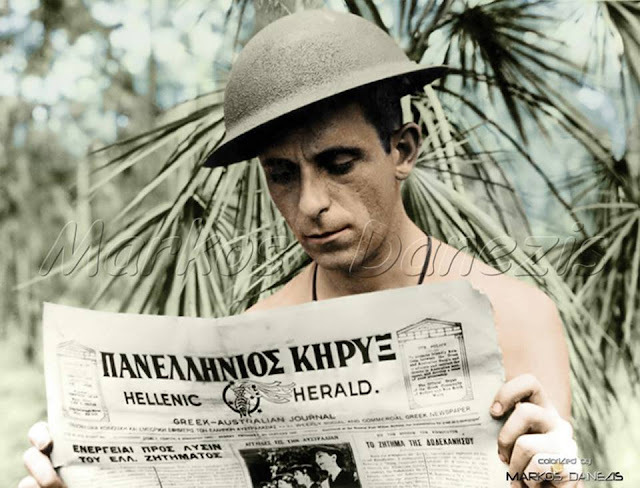 The newspaper is the “ΠΑΝΕΛΛΗΝΙΟΣ ΚΗΡΥΞ” or “Hellenic Herald” and according to the caption “Xenophon Castrisos (Castles), an aerial photographer with the Royal Australian Air Force, reads the Hellenic Herald, a Greek-Australian newspaper, during World War II”. While the surname “Castrisos” or “Castrissios” is common in Kythera island, Greece, there are other places, such as Naxos island where this surname may be found. This mystery, as to the exact origin of this WW2 soldier persisted and the best option would be to contact the John Oxley Library, State Library of Queensland, which owned this WW2 photo. Librarian Jennifer Freeman, professional, courteous and a keen researcher, provided me with all the info she could gather, including previously unpublished photos, as well as details to the life and death of this Greek, who emigrated as a young man to Australia, a land that he called home for the rest of his life. Xenophon Castrisos was part of the BEF in Greece, as a photo of Australian soldiers with a Greek soldier and civilians under the Acropolis attest. “Based on what I’ve managed to piece together, there is most certainly a Kythera connection, and that connection is via the Freeleagus (Φριλίγγος) family. Xenophon was the son of Maria Castrissios, née Freeleagus, nephew of Christy Freeleagus, the Greek Consul for Brisbane, Queensland, and grandson of Kosma Anthony Freeleagus of Kythera. You can read about his uncle Christy Freeleagus in the Australian Dictionary of Biography. Xenophon’s full name was Xenophon Haralambous Castrissios as evidenced by his intention to naturalise. He was naturalised on 26 September, 1941. According to this naturalisation documentation, he was born in Lourenço Marques (now known as Maputo, Mozambique) but on a passenger list dated 1939 he quotes the island of Rhodes as being his place of birth. This same document reveals his date of birth – 1 January 1912. The National Archives also holds Xenophon’s WW2 service record, which gives Lourenço Marques as his birthplace and confirms the date of birth as 1/1/1912. This document reveals his war service. Unlike the WW1 service records held by the National Archives, the WW2 service records have not been digitised. By checking the Ryerson Index to death notices I can report that Xenophon died in on the 2nd November, 2000. A death notice was published in the Sydney Morning Herald the following day. I’ve been able to add a little detail to the information I sent re Xenophon..
I’ve also managed to ascertain from the Solomos Society here in Brisbane that our two photographs of the rower attributed to Xenophon are in fact photographs of his cousin, Charles Peter Freeleagus, another nephew of the Greek Consul, and champion rower.. we will endeavour to correct these details in our catalogue records.